This winter has seemed particularly miserable …. More wet and grey than I remember Scottish winters to be, but maybe it’s just me! I am very happy that I decided to take the leap in the autumn and finally get some Drops Andes yarn – lovely, soft, chunky yarn in 65% wool and 35% alpaca. I had seen some at work and had hopes I would be able to wear it without it becoming itchy – and I was right! 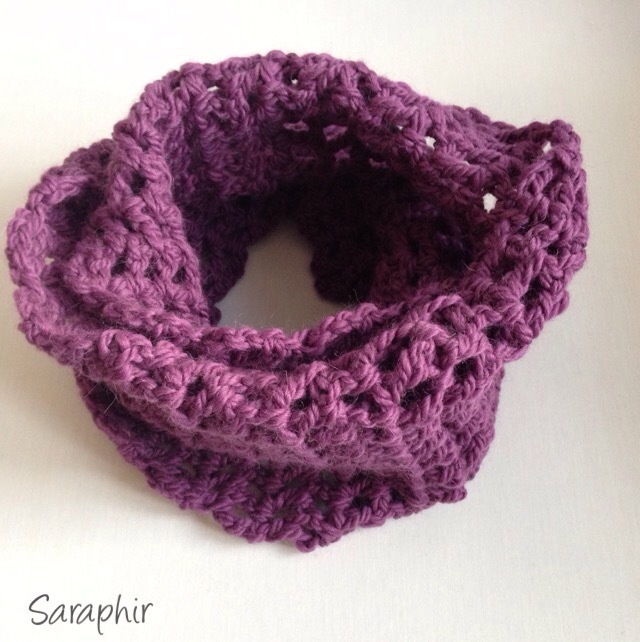 I also had plans to make cowls to sell at my Christmas markets so once it had arrived I started working out a pattern. I wanted to make something simple; partly because I like simple patterns (too much frill is not really my thing) and partly because if I was to make them for sale it needed to be a pattern that works up fast and easy – otherwise it’s not really financially viable. 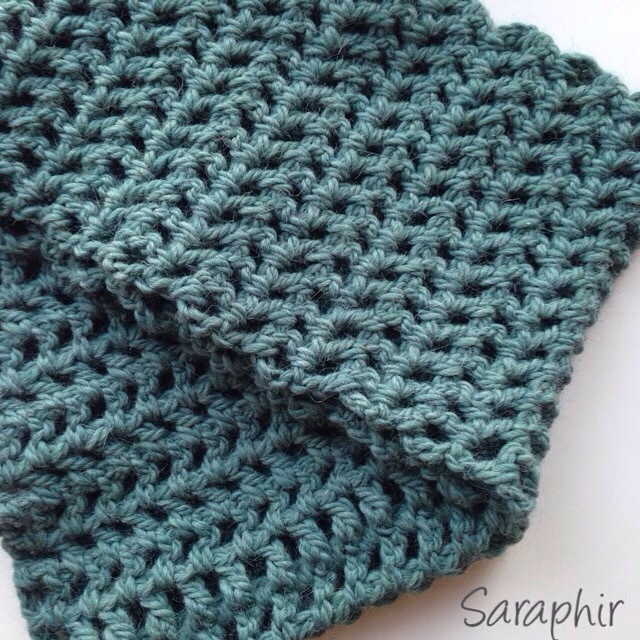 So I had a look in my trusted book of crochet stitches for inspiration and noticed a stitch that is a variation of the mesh stitch I use for the wrist warmers I made (pattern available here). Only instead of working treble into treble you work treble into the chain space: the effect is a mesh in a herringbone style pattern, which I think is really rather lovely and suits the yarn perfectly. You need 2 skeins of Drops Andes yarn for the cowl and an 8 mm crochet hook. 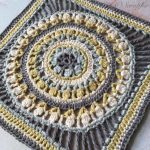 The yarn is chunky – the yardage is 48 m per 50 g. The pattern is written out in UK terms using abbreviations, but a translation into US terms is included in the document as well as a guide to the abbreviations. Row 1: 1 tr in 5th ch from hook, (ch 1, skip next ch, 1 tr in next ch) till end. Turn. Repeat row 2 about 60 – 64 times or till the cowl measurement around 58 inches/ 148 cm. Fasten off and put together the two ends of the scarf so that the mesh lines up. 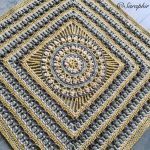 Crochet the two sides together with 2 double crochet stitches in each chain space. Fasten off and weave in ends. Row 1: 1 tr in 5th ch from hook, (ch 1, skip next ch, 1 dc in next ch) till end. Turn. Fasten off and put together the two ends of the scarf so that the mesh lines up. 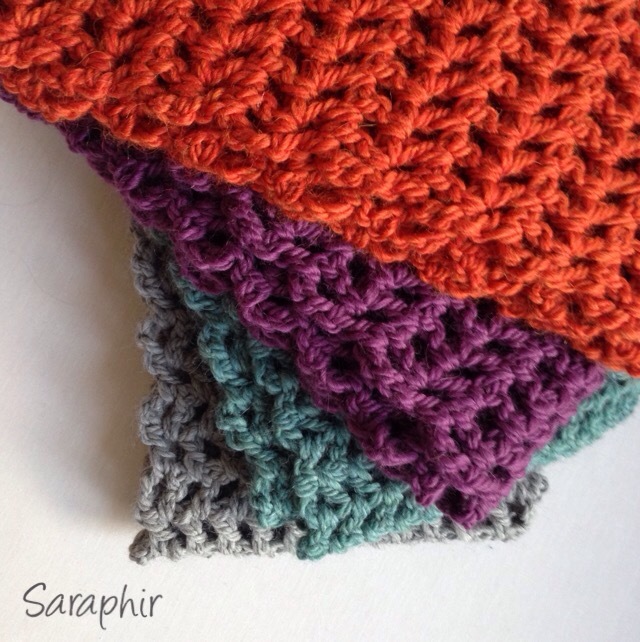 Crochet the two sides together with 2 single crochet stitches in each chain space. Fasten off and weave in ends. 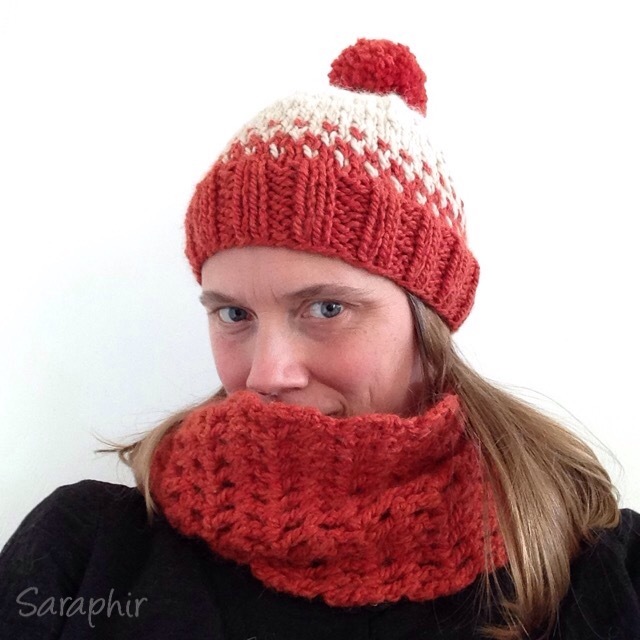 I have had my orange cowl since before Christmas and have worn it practically every day. It is soft, snug, and keeps its shape really well. A friend of mine has it too and she says she has many cowls but this one is the best fit and very comfortable to wear (I credit the yarn, not me!) And as you can see below it goes very well with my hat knitted in the same yarn – the pattern for this will be coming soon!